Camillone, down in front with quilt, and her Mercer fans. Camillone was surprised with a quilt that incorporates Vikings sports team t-shirts. Camillone, center, surrounded by some of her Mercer family, clockwise from upper left, former Men's Assistant Basketball Coach Jordan ingram, current Men's Assistant Basketball Coach Stan Tuchez (a 2012 alumnus), current Women's Assistant Basketball Coach Jane Berlinger, and Athletics Administrative Specialist Erin Cahill (and her son). 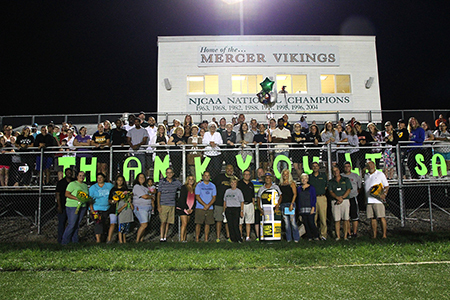 West Windsor, N.J. – In a moving ceremony at the Soccer Stadium on Sept. 21, Mercer County Community College (MCCC) gave a fond salute to Athletic Trainer/Associate Athletics Director Lisa Camillone for decades of dedicated service to students.. Camillone, a pioneering figure for female athletic trainers, worked the last two games of her MCCC career on Wednesday after 33 years at Mercer. 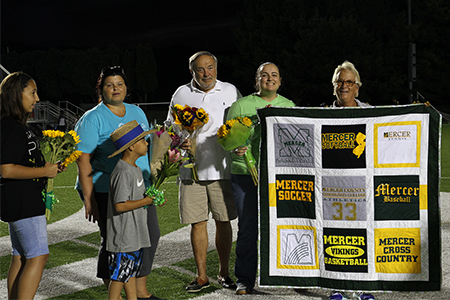 Current and former staff members, many athletics alumni, current students, and Camillone’s family all joined in the tribute, which took place between the men’s and women’s soccer games versus Essex County College. While Camillone says the time has come to move on to the next phase of her life, she expects to return to MCCC athletic events often. “These people are like my family,” she said, gesturing to a sidelines filled with coaches, assistant coaches, community volunteers and students. "How could I stay away?" 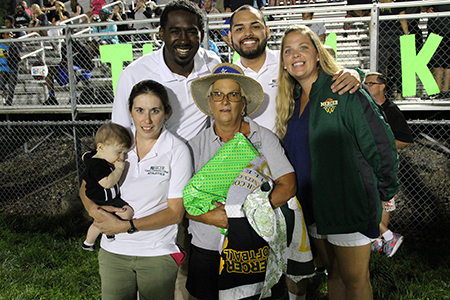 In addition to her work with students in the training room and her presence on the sidelines at every Vikings home game ready to assist athletes in need, Camillone also served as an adjunct professor in the Health and Physical Education Department. Camillone broke new ground in athletic training, paving the way for women in the field. She served as the first female President of the Athletic Trainers Society of New Jersey (ATSNJ's) and was inducated into the Society's Hall of Fame in 2012. She received ATSNJ's Distinguished Service Award in 2006. She is a member of the Athletic Training Advisory Committee for the State Board of Medical Examiners. She received the National Athletic Trainers’ Association (NATA) Service Award in 2006 and served as a member of the NATA’s Women in Athletic Training Committee from 2000-2005. In addition to her tireless work on behalf of MCCC student athletes, Camillone has been involved in numerous service projects. She volunteered in both state and national games for Special Olympics, which were held in New Jersey in 2014. In 2012 Camillone and her daughter, Andrea, hand-knitted over 100 winter hats that they donated to the Needlework Guild of America, which distributes to a variety of charities throughout New Jersey. In 2013, Camillone was the winner of the Patricia C. Donohue Leadership Award presented by Mercer’s chapter of the American Association for Women in Community Colleges for her leadership and mentoring of young women. Camillone has been featured in several magazines, including Training and Conditioning (2011) and Moxie Woman (2011).